A retired head teacher has pledged his support to raising vital funds for leading cancer charity Beating Bowel Cancer. Rob Ratcliffe, who lost his own son Jonnie, aged just 28 to the disease five years ago will take to his bike along with thousands of others to complete the ‘Ride London’ challenge. This ‘Ride London’ event is a 100 mile cycling course on last year’s Olympic route – starting at the Queen Elizabeth Olympic Park and finishing on The Mall. The team captain for the fundraising efforts is Matt Dawson, former England rugby player and star of television show Question of Sport. 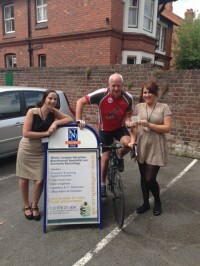 This is the third cycle challenge Rob has undertaken on behalf of the charity. In 2010 the team completed a 115 mile stage of the Tour de France from Lavelonet to Narbonne. Last year they cycled from Jonnie’s home village (Gresford) to the Beating Bowel Cancer offices in Teddington, London – a total of 216 miles. Between the two events their efforts have raised over £30,000 for Beating Bowel Cancer. Both Rob and his wife Gill now work voluntarily as ambassadors for Beating Bowel Cancer. The aim of Rob and his fellow cyclists is to continue to support the work that Beating Bowel Cancer do in respect of prevention and support. As ambassadors for the charity, they are available to give talks to groups and organisations to help raise awareness of bowel cancer which is the second most prevalent type of cancer, and one which is affecting more and more young people. As well as his work for the charity, Rob now works part-time as a Business Development Officer for New Directions Education – a leading recruitment and training provider based in Wrexham. Since his retirement, Rob has worked with the business to aid schools in North Wales secure the best recruitment and training solutions for their teams. Jenna Whittam, Branch Manager for the team comments ‘Rob works tirelessly to raise awareness for Beating Bowel Cancer. We support his efforts 100% here in the office and in the rest of our branches across England and Wales. Educating individuals on prevention and helping support those families living with the disease is vital. Our team will be cheering Rob and his team mates every step of the way’.